2016 Mid Year Newsletter: It's Been a Busy Summer! Daniel O'Laughlin, co-founder of Recovery Africa, celebrates 14 years of Recovery! Dan is holding a painting of a Ghanaian market scene painted by Steve Hay, a local artist in Bethesda, Maryland. The painting was given to Dr. Gerald Marti in appreciation for his help and support with Recovery Africa. Dr. Al presented at the annual conference of the Ghana Physicians and Surgeons Foundation (GPSF) in Atlanta, Georgia. As Recovery Africa's Medical Director, he spoke on the disease of addiction and health literacy in Ghana. His presentation was very well received. Edwin Ahadzie, the manager of the House of St. Francis who was in the US at that time, attended the conference and spoke on his recovery experience. Recovery Africa was honored to have been given the chance to present at such a prestigious conference. The visit began and ended with training/motivational sessions at the House of St. Francis (HSF). The residential non-medical treatment facility was started by Byron Merriweather and others in September 2012, and has been largely handed over to the Catholic Archdiocese of Accra. By the end of 2016, the HSF plans to open a medical detox with the assistance of New Crystal Clinic, a nearby clinic. HSF has treated over 160 residential clients and is considered to be one of the best facilities in Ghana. In April 2016 another Oxford House for men was opened near the HSF. It is intended as after care and transitional housing for HSF clients. Women attend HSF on an outpatient basis. On leaving Ghana, John Elford said: “I had little idea that the reception we received would be so genuine, friendly and warm”. Seminar on the role of churches and addiction The session was a follow-up to a training conducted in 2015 by Recovery Africa and Art Mellor of the United Methodist Church in the United States. The day was largely centered on the theories that form the basics of the WISC Integrated Step Course and The Sponsors 12 Step Manual. John Elford was impressed by the great attendance and how the participants had a scholarly understanding of the topics. Cape Coast Training At the request of the Medical Director of the Ankaful Psychiatric Hospital, five days of training was conducted for their “Twelve-Step Rehab Center” in Cape Coast. The 27 participants included most of the staff from the facility, and also representatives of the Ghana Prisons Service and the Ghana Police Service. The training was enthusiastically received and has been followed up on behalf of RA by regular visits in June, July and August from Accra by Pastor Richard Obli and his team. American Chamber of Commerce in Ghana (AMCHAM) Breakfast Nearing the end of their visit to Ghana, Dr. Al and John participated in a breakfast to examine the possibility of introducing Employee Assistance Programs (EAP) in Ghana. Hopeful Way Foundation is a member of AMCHAM and also hopes to involve American companies in the building of the Recovery Ghana Consortium, the Annual Recovery Walk and a Recovery Movement in Ghana. Ciara Weeks spent two months interning at the House of St. Francis (HSF). She has been learning, teaching, and getting experience with people in treatment and recovery during her stay in Ghana. She is a candidate for a Master’s Degree in Social Work (MSW) at the University of Georgia. At her send-off gathering she said, “I’ve learned a lot in the past weeks at the HSF and have had a humbling experience seeing people in recovery leading the program”. The manager of the HSF, Edwin Ahadzie, thanked Ciara for “bringing new ideas to us, and reminding me about some things that the HSF should be doing.” A HSF client said that “Ciara brought many games to us such as Jenga; we again found ourselves having great fun without using drugs or alcohol.” Two additional MSW candidates will continue Ciara’s work at the HSF during the next three months. Oyarifa Recovery Center In August, the eight men in the Oyarifa Oxford House moved to the women’s house. The resident in the women’s house moved to a nearby smaller house. Two training programs were held at the The Oyarifa Recovery Center (previously known as the Oyarifa Oxford House) in August. We are studying how to make best use of the facility to further recovery in Ghana. RA and our partners in Ghana are also assisting professionals and others to examine the possibility of establishing an Employee Assistance Program (EAP) which may initially be housed at The Center. Chris Budnick Visit Chris Budnick, and Amanda Blue of Healing Transitions in Raleigh, North Carolina will be in Ghana for the Second Annual Recovery Walk on September 24, 2016. They will also study and advise on RA programs, including the proposed detox at the HSF, the Oyarifa Recovery Center and the Recovery Café. RA wants to establish a relationship between its programs in Ghana and the recovery community in North Carolina. Recovery Walk This year’s walk on September 24, 2016 promises to be even more successful than last year's walk with about 500 walkers and up to 1000 persons gathering at the chief’s palace in James Town, Accra. The objective is to have the residents and their organizations in James Town take ownership of the walk and to plan a recovery approach after the walk. RA and our sister organization, HWF will also team up with James Town to establish a drop-in center. 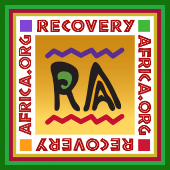 This Newsletter is an update on the programs supported by Recovery Africa, Inc. (RA), in Ghana. It highlights a visit by Dr. Al Mooney, co-author of The Recovery Book, and John Elford, an addiction professional from the United Kingdom (UK). They were in Ghana from May 23 to June 8, 2016, as guests of Recovery Africa and our sister organization in Ghana - Hopeful Way Foundation (HWF). Dan and Agnes O’Laughlin are in Ghana until the end of October. They believe that the visit has been one of the most productive by addiction professionals who have come to Ghana to assist RA’s programs.